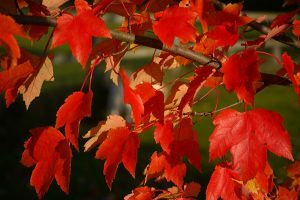 Planting trees or shrubs this fall? How will you go about making your plant selection? 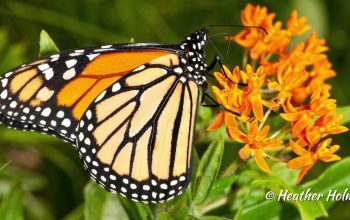 If you have been reading the EcoBeneficial website, hopefully you have been inspired to choose native plants. 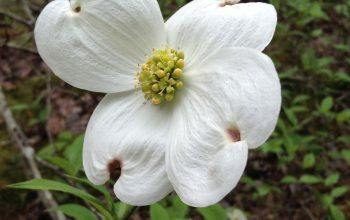 Beyond that, your choices might be more complicated – should you choose plants that are native to your immediate area or native to your region? Locally sourced or not? Organically grown or conventionally grown? 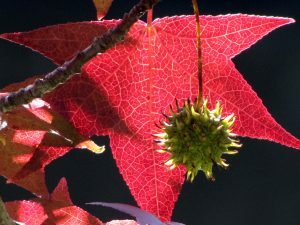 A choice that we rarely even contemplate is “native plant or native cultivar?” Often we have no choice at all – we simply buy what is available at a local nursery – and frequently that means a “nativar”- a cultivar, or selection, of a native plant. There can be significant ecological implications to this choice. Perhaps you go shopping for a Red Maple (Acer rubrum), but the only one in stock at the local nursery is the nativar Acer rubrum ‘Brandywine.’ Will this plant function the same way ecologically as Acer rubrum? In this case the answer is a clear “no.” ‘Brandywine’ is propagated by tissue culture (asexually), not from seed (sexually). Every ‘Brandywine’ is a clone of the parent plant – where that initial tissue was sourced. Since genetic diversity is key to a healthy ecosystem, clones are not your best ecological choice. The full ecological implications of nativars versus natives are not clear cut, and, to date, there has been very little research on this topic. 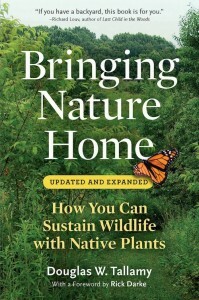 Enter Dr. Doug Tallamy, the noted entomologist from the University of Delaware and author of the revelatory book, Bringing Nature Home. Tallamy and his graduate student, Emily Baisden, have partnered with the Mt. Cuba Center on a multiyear research project. Their goal is to determine whether cultivars of woody plants are as attractive to insects as are straight species trees and shrubs. 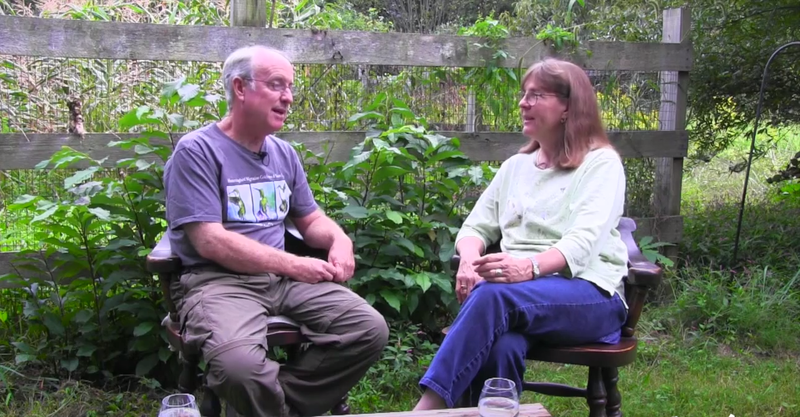 Dr. Tallamy sat down with Kim Eierman of EcoBeneficial to discuss his research and the preliminary results (click here to listen to the podcast interview). When asked why he decided do this research, Tallamy explained that so much of the Earth is now dominated by humans that “it is important to keep life in our landscapes where we live, work and play.” He elaborated, “we need to literally rebuild functioning ecosystems right in our yards.” Attracting more native insects into our landscapes is critical to building healthier ecosystems. For the study, sixteen species of trees and shrubs were selected, along with multiple cultivars of each species – a total of 160 plants. 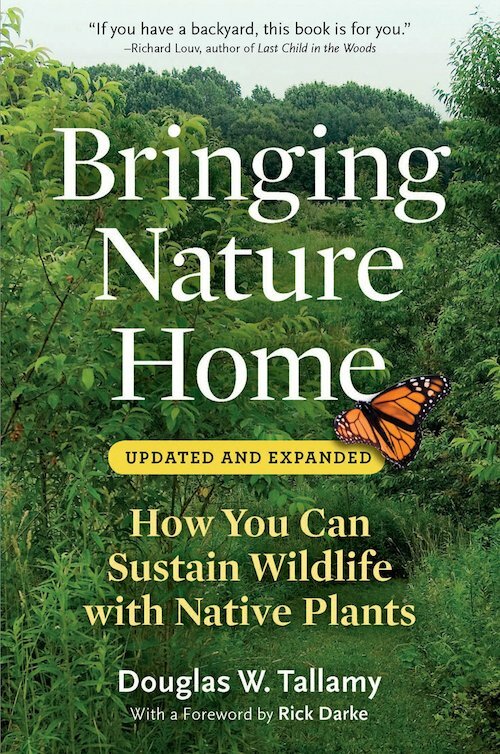 Some of the plants include: Red Maple (Acer rubrum), Sweetgum (Liquidambar stryaciflua), American Elm (Ulmus americana), Redcedar (Juniperus virginana), Winterberry (Ilex verticillata), Redosier Dogwood (Cornus sericea), Highbush Blueberry (Vaccinum corymbosum), and Arrowwood Viburnum (Viburnum dentatum). Each straight species woody was planted in the middle of a circle, with cultivars of that species planted around it. This gave insects an equal opportunity to choose any of the similar plants. Many types of insects were sampled including: owlet moths, inchworms, tree hoppers, leaf hoppers, many types of caterpillars and beetles, even predators and parasitoids. While adult insects were often detected, they may have simply been resting. The presence of immature insects clearly signaled the use of a plant by a given insect species. Graduate student, Emily Baisden, conducted the sampling three times during the season, identifying every species, the count per species (species richness) and the number of species (species abundance). Some insects were vacuumed off a plant and sampled, while more recalcitrant insects, like caterpillars and beetles, were sampled by hand. Tallamy chose cultivars that varied from their straight species counterparts in one of four ways – 1) plant habit, 2) disease-resistance, 3) leaf color variation and 4) increased berry size. Many cultivars differ greatly in habit from their naturally occurring counterparts – taller, shorter, prostrate, weeping, fastigiate, etc. Does it matter to an insect whether a cultivar of a tree is abnormally tall and skinny? Tallamy hopes to answer this question in his research, noting that plant habit certainly matters to nesting birds – another ecological implication. 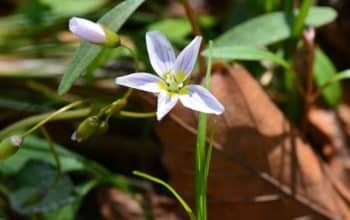 With so many native plants being devastated by introduced pests and diseases, disease-resistant cultivars have gained a big following. The once common American Elm (Ulmus americana), decimated by Dutch Elm Disease, is one plant that Tallamy is studying. 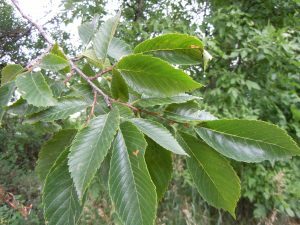 Preliminary results indicate that the ‘Princeton’ cultivar, which is resistant to Dutch Elm Disease, is no less attractive to insects. A very good sign, according to Tallamy who holds great hope for the introduction of “back-crossed” American Chestnuts (Castanea dentata) that were almost eradicated in the last century by Chestnut Blight. (See the American Chestnut Foundation website for more information). Variation in leaf coloration is another characteristic being studied in this research at the Mt. Cuba Center. Cultivars are often propagated for unusual, showy leaf color or variegated leaves. Tallamy expected that purple-leaved cultivars, whose leaves are loaded with anthocyanins, would not be as attractive to insects. The research results confirmed his suspicion. Leaf variegation is trickier – Tallamy indicated that attractiveness to insects depends on the percentage of variegation. In the study, a Sweetgum cultivar with very little leaf variegation was attractive to insects, while a Dogwood cultivar with much more pronounced leaf variegation was unpopular with insects. Food for thought when you shop for plants. Enhanced berry size is another feature Tallamy examined. With the “bigger is better” attitude now so prevalent, many cultivars are being selected for their enormous berries. 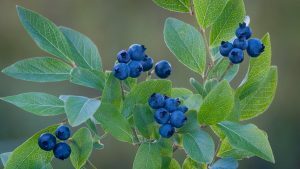 Much to his surprise, the larger-berried Highbush Blueberry cultivars supported more insect species than their straight species counterparts. It is important to note that larger fruits may be problematic for some birds. Dr. Doug Tallamy and Emily Baisden are continuing their important research at the Mt. Cuba Center and hope to extend their fieldwork for another year. 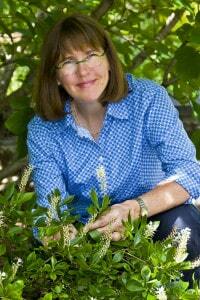 For the ecologically-minded gardener or landscape pro, the resulting information is invaluable. Now, if we can just get the attention of those big box stores. interesting to see the comparisons. looking forward to hearing future results!